This is a book, NOT AN APP! Why isn't this on iBooks? I was very excited when I purchased this because I have been waiting for an iPad version of PortalI for what feels like forever...so I bought this thinking it was a version of the game. False advertising! This should be sold in the book section, NOT THE APP SECTION of iTunes. I feel that this was intentionally done to get people to buy it. Loved the behind the scenes look at this amazingly innovative company and the phenomenon that is Portal. I'd really love to read an entire book on this subject. Five stars for a Royal Wedding reference! One of my favorite classic movies. waste of money!! this is more like an eBOOK and it should be in the IBook section.. not a game.. wasted my time and money. Please keep making more of these. They are perfect companion pieces after you finish a game. Very nice effort for interactivity and presentation as well. Love it! The amount of content in this about Portal 2 is awesome. The only thing is the app keeps crashing for me on videos and pages with interactive art. I really want to enjoy the entire app, but I can't see most of the content. I will have to pick it up on steam was well if I really want to see everything. I love seeing behind the scenes stuff like this from the developers, especially Valve. Keep these coming, guys! The mag is one of the best digital mags I've seen thus far, all around totally worth the purchase! This was a fantastic behind the scenes story of Portal 2. I enjoyed the inside look at Valve and the concept art. Thank you Geoff! Inside the greatest software dev house of the last decade. I know Valve software. It's like a fantasy land where everyone is treated like equals, no one works the insane 16 hour shifts, and every game is a winner. If you have never played a Valve game you need to read this intimate behind the scenes of one of the most amazing companies in the world. Don't hesitate, you will quickly forget about the 2$ you just spent after your first few chapters. I can't say enough good things about this application. I'm sure there are some bad things about it, but the writing alone (3 years worth, really) was well put together, and if anything makes for some good reads. Lots of interesting story here with cool interactive content. A must for portal fans! I got this on my new iPad. Really great! Already love it, and I'm just a few pages in. Would be nice if the text was updated for retina, its really weird to read, but I'll still do it of course. This is the greatest ripoff of all time, when I downloaded I was expecting an awesomely awesome app! I.E the iPad version of portal 2*, but instead I got a book, A BOOK! I would rate this a 0⭐️'s but I had to do at least 1⭐️. Geoff make the actual iPad version, if you do I will rate 5⭐️'s. Do not buy if expecting iPad version. We sometimes forget how much time and effort is put into creating a game. This app (read: interactive magazine/article) shows us again that the Valve team doesn't think of it only as a series of games to put out for money, they think of it as an experience. Other studios should take a lesson from Valve. This app goes into very little detail on what would have been portal 2 but of course those ideas may be used in the future and they still would like it to be a surprise when that time comes. Anyway, I just purchased this a couple of hours ago and could not stop reading. I love the concept art included. The links leading to other sources to read more background of the actual game. Thank you for reminding us that there are people behind the game and that they sacrifice so much of their time to bring us a great game. WOW! Best e-reading experience EVER! I could write forever about how good this app is, but here is my attempt to be brief. Wether you have ever played Portal (or any video game for that matter) or not, you will most likely find this book very interesting, informative, and most importantly entertaining. Just learning about Valve's business practices has change my views on how a company should run. To top it, they actually managed to make the interface entertaining. The interactivity is truly innovative. You have to experience it to fully appreciate to nuance it adds to the reading experience. Of course, if you love Portal and/or Valve this is a MUST READ! I didn't think it was possible to love Portal more than I did (or respect Valve more). But reading this has managed to raise my love and respect for both the game and the developer (not to mention the writer of the book itself) to a new level. This is not a game my 4 and 10 year old are very up set. I am to I paid $2.00 for a stupid book on this game really. DO NOT BUY!!!!! DO NOT BUY!!!! I want my money back. This is one of the better interactive digital features I've seen. The app makes good use of the iPad instead of being a glorified PDF reader, featuring panoramic shots, enlarge-able photos, and embedded video links. Beyond that, though, it's impressive games journalism; the level of access that Keighley has had with Valve is incredibly rare in this industry, and his coverage is both engaging and thorough. Highly recommended! Talk about a great read! Coupled with the interactivity of videos, polls, photos (including panoramas) and slideshows, this read became more like a universe to explore rather than another article. Though I knew nothing about the staff of Valve or the efforts it took to put the game together before this read, I now truly feel like I was a part of the experience. (Not a productive part, but none-the-less, a part.) I feel like I now share memories with those who've made one of my favorite games of all time. Edit: This needs to be optimized for the new iPad. As an aspiring game developer it was really great to get an inside look at the development process of what is sure to be at least a contender for game of the year among several publications. It is refreshing to see how Gabe's style of management continues to allow Valve to put out some of the most creative and engaging games in a time where sequels have more often than not been trending toward DLC driven recycled gameplay. Portal 2 was a great game and this app was very well written and included awesome interactive exclusive content, well done! This is the way I've always wanted to see behind-the-scenes: interactive information on an intuitive platform. Thanks Geoff! I really enjoyed the book but it was kind of short. It seemed like a marketing piece for Portal although it does give a cool insight into the world of Valve. Overall, I'm not complaining for $2. This app is so well done - it was fantastic to see what the development process at Valve was like during the making of Portal 2. Other magazine apps need to look at this app to see how things are done correctly. I know that some people may scoff at the price point of the app (I did myself) - but after purchasing it, I felt like I really got my monies worth - afterall it's about the price of buying a soda...and kept me entertained much longer than a soda does! I really hope that Geoff does more of these in the future. This is exactly what tablet books should be. Well written, dynamic, and full of fantastic multimedia goodies. I absolutely love this app/book. It made me feel vindicated in getting an iPad. Portal 2's polished and effortless presentation betrays a cringe-inducing drama to finish the most anticipated game of 2011. 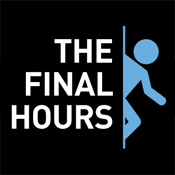 Over the course of fourteen in-depth chapters chronicling the lives of several key players, The Final Hours provides an exclusive portal into the Valve headquarters. It took me about two hours to finish everything from cover to cover, watching videos, toying with interactive examples, and sifting through many galleries of unused assets and trashed ideas. Absolutely necessary for any fan of Portal 2, Valve, game development, or the creation of art in general. This app represents a great piece of journalism and a fantastic insight into a company deserving of all its praise and more. An amazing read from start to finish, well worth the price. Great app. iPad portal GAME plz! This app was designed specifically for the iPad, and it shows. Great content and use of different media. Once I started reading, I couldn't put it down. Easily worth the entry price, especially if you are a fan of Portal or Valve. This app gave a somewhat interesting look at the development of the post-release Portal 2 content. However, it was far too short for me to recommend. I read it in around ten minutes, which, for $1.99, does not make it good value in my opinion. Great insight into one of our generation's best developers and game franchise. Kudos! A look into gaming's best company. This is great for 2 dollars. This app is one of the best examples of use for feature articles in any genre of reporting. It's an intimate look at Valve's process for making what is almost sure to be a game of the year, unprecedented access and full of all the details sweet and gory. The interactivity adds to the wonderful writing providing context context and just plain fun. A must buy for Portal or Valve fans (usually not mutually exclusive) or anyone interested in how a respected game maker can continue to make some of the biggest hits of the decade. Spoiler: it's apparently very hard. A very fun and informative read. Loved all the history behind a lot of the team members and ideas behind the original Portal and Portal 2. A well spent $2 for any Portal or Valve fan!